In instructional design and learning theory circles there is a famous, if somewhat troubling, fact that has plagued educators and instructional designers for years. The person who first identified this troubling fact was Hermann Ebbinghaus, a German psychologist who was a pioneer in studying memory and how memory ties to learning. What Ebbinghaus discovered through his research is often referred to as the “forgetting curve.” In short, the forgetting curve demonstrated that students in a classroom tend to forget about 90 percent of what they learn in class within about 30 days. 90 percent, in just 30 days! Even worse, most of this forgetting occurs within the first few hours after class is over. So, that’s the bad news. The good news is that Ebbinghaus also discovered that a student could improve the length of memory retention simply by repeating the information in timed intervals. And, logically, the more the repetition the more retention. So what does this mean for the self-educator. Figure out ways you can repeat what it is you have learned regularly. This might mean repeatedly going over your notes, explaining to yourself out loud the information and concepts you have learned, telling others about what you have learned, creating your own flash cards you use periodically, repeating a particular skill over and over, and so on. Do whatever it takes to repeat, and repeat often. 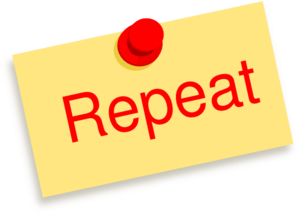 As for when to begin repeating, I suggest you start immediately after you initially learn something. Why? Because research shows that thinking or talking about something immediately after it happens dramatically improves the retention of the information. Always keep in mind that research shows that memory may not be fixed at the moment you actually learn it. However, if you utilize repetition and do such repetitions at regular intervals, you are much more likely to place that information in your brain in a more long-term form. Also, try to figure out ways to expose yourself to information and repeat it in smaller chunks rather than in huge streams. Optimal learning takes place when we gradually incorporate new information into our memory as opposed to trying to absorb it all in one fell swoop.